Fire dance choreography is an intricate and complex set of dance movements, footwork, hand and arm placement, synchronized prop manipulation, blocking and beat counting. We specialize in solo, duet and multiple dancer choreography, featuring fire modalities. Fire dance choreography is a unique and innovative niche, which takes tremendous practice in both the art of fire spinning and technical dance. Our trained dancers create and execute choreography with exact timing and placement of fire tools. 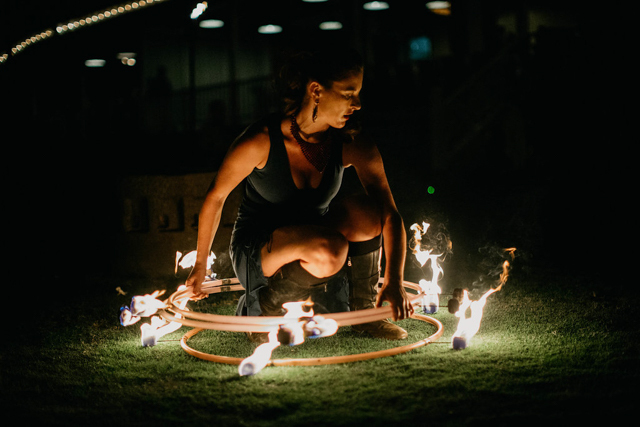 Fire dance choreography is best created at a certain tempo and beats-per-minute due to the necessary timing of the spinning fire prop. If too slow, the fire cannot rotate fast enough to keep the dancer safe, if too fast, footwork, lines and placements can be sloppy. It is best to work within a range that is appropriate for each modality. However, certain props can be used during slower songs, due to the nature of the props capabilities. It is important to understand the capacities, timing, dimensions and nature of multiple props when creating fire dance choreography. This allows the dancers to work within the limitations as well as explore new magnitudes of each prop. We are continuously up-leveling our techniques, training, methods, and practices for performance. Our fire dance choreography is unique and innovative, and we pride ourselves in detail and accuracy. Intricate blocking, flow and movement for each piece will create emotion for the crowd. Our aim is to create choreography that is gripping, powerful and tasteful. We utilize the power of the fire with the draw of human emotion to design each piece.